Home Beers Brasserie Dieu du Ciel! According to legend, Herbe à Détourne makes one lose their way should they happen upon it. This is an ale inspired by the Triples of Belgium with a new world spin by way of the American hop varieties employed. Citra hops are used unabashedly, presenting mango, cantaloupe and citrus essences, accompanied by a seriously hoppy and floral aroma. Just when you thought that craft brewer creativity was running out, we get the masterful brewers at Dieu Du Ciel splicing together the time honored Abbey-style Tripel with trendy Citra hops. Its results really bring to life the fruit-forward and acute bitterness that which Tripel Ales are well known. Pouring a hazy gold color with a peach tinge, its opaque sheen gleams like a nightlight when back lit. As the beer settles, a vibrant cotton-white froth pulls from the beer's body and adorns it with a cap of sturdy foam. Retaining solidly, the foam does settle but is quickly regenerated with a gentle swirl, leaving waves of lace on the glass at each turn. Bright fruit aromas pull ahead of its balancing spice with ease. Ripe oranges and tangerines fuse with ruby red grapefruit for a full citrus scent. There's an element of tropical passion fruit and mango that contributes to the nose but its the citrus that takes center stage. A background set of notes from yeast and hops peak through with white wine acidity, white pepper, clove, coriander, white pepper, fresh cut grass and a slim glimmer of cannabis. Flavors are straight up of freshly squeezed orange and grapefruit juices. Nearly overtaking the 'beer' components, its fruitiness dominates it taste. But it does so with the teeth churning combination of confectioner's sugar in maltiness and pleasant acidity. Its balance of vinous white wine, light straw, grass and hay support the fruit well but hardly rival its intensity. Its dry taste in finish allows a slight biscuit sweetness to remind the palate that this is still ale. Medium-bodied, the favors early creaminess over any champagne-like zestiness. But the ale relies on its exorbitant strength and high hop rates to assist in dryness, cleanliness and crispness. The ale trails with citrus and white grape acidity before a medium-dry closure. Dieu Du Ciel really knows how to build a beer! Every risk they take pans out spectacularly. And that's exactly what they do here. They completely rip apart the balance that makes Tripels so great, but they put it back together with the citrusy American hops at the forefront and it doesn't just remember the base style, it might actually reinvent it! A: The beer is hazy yellow in color and has some amber hues. It poured with a thin layer of off white bubbles and has relatively good retention properties as the head never completely faded away. S: There are moderately strong aromas of tropical fruits in the nose—pineapple seems to stand out in particular. T: Similar to the smell, the taste has flavors of tropical fruits and a light amount of bitterness. There are some hints of spices and no sweetness is detectable. M: It feels medium-bodied and somewhat smooth on the palate and has a moderate amount of carbonation. O: The beer tastes strong but for the most part the alcohol is well hidden from the taste. The amount of hops seems to be very unique for the style, which almost tastes more like a hybrid between a tripel and an IPA. just a fantastic beer, but everything these guys make is that good. its a tripel, but only loosely here. so much hops, all citra, as to almost render it not recognizable to its original style base. the color is a hazy straw, with a short lived less than an inch of white head. the nose is all citra, i mean, there isnt even a chance that its another hop, its pure citra, bitter and oily both, and the taste agrees, all citra here. lemon curd and tang and bitterness, in with a grain bill thats fairly complex, and a belgian yeast strain that has some fruit, but cant touch the fruitiness of the hops themselves. easily the fruitiest example of the style i have ever seen, and as good as all of the beers are from these guys, now in my mind one of the premier brewers in the world. i never really loved tripel ales, but this is a game changer. From a 12 oz bottle served quite cold. $2.89 can. A bargain! Less than a month old. L: Quite hazy golden yellow with a fleeting white head. S: Lots of grapefruit, candy sugar, tropical fruit. T: Tastes of grapefruit, candied sugar other citrus flavors. There is lots of hops but the bitterness is balanced by the sugar. F: Active carbonation, quite easy to drink. Mouthfeel is quite complex with the various flavors that sort of stack one after another keeping it interesting. O: Another winner from DDC.! However it's quite sweet and at 10% abv you have watch out. I'm not sure I would drink it in summer as a thirst quencher! From a 341ml bottle, dated 2016-03-07. Served in a Dieu du Ciel! tulip. Pours an unfiltered glowing gold colour with a pillowy two-finger head. Retention is good and leaves wads of thick, sticky lacing. Smells like an entire boulangerie full of rising baguettes, chamomile, sweet herbs and apple blossoms. Tastes mildly sweet with some biting tartness along with it. Sourdough bread and white grapes, kiwi, grapefruit pith, coriander and a clean earthiness. Finishes clean with some boozy warmth in the gullet. Mouthfeel is light-to-medium bodied and dry with en tabernak of superfine carbonation. Overall, other than the label itself, there is nothing about this beer that would alert you that it is over 10% abv until you actually try to get up off of the couch to rinse out your glass. The citra bitterness is an interesting and effective foil to what might otherwise have been too sweet for my tastes. Very nice tripel! What a good beer! A triple very well made. I have only found one item to highlight and keep in mind: the temperature and evolution in the glass. The beer has improved me a lot with the temperature and with the oxygenation. I'll repeat surely because I liked it a lot. Delicious. The hop aroma comes through nicely and add an interesting twist. A little on the dark side for a tripel, but it plays well. L: Hazy pale yellow with a nice white head that leaves some lacing down the side. The head itself stayed for a while before disappearing leaving a small layer. Has some small chunks floating around in it as well. S: Very citrusy, orange peels and slightly sweet, expected from a triple but a nice surprise with the Citra hops. T: Very strong amount of Citra hops without the bitterness which is nice, it doesn't have a sweet taste when your drinking it and you can't tell the alcohol content in the beer either. Once s walled it has a slight sweetness that stays around for a little while but it's a nice sweetness not a bad one. F: very light bodied leaving a good flavor in your mouth has a small amount of carningayion but the perfect amount to make thsee beer amazing. O: Probably one of the better beers I've had in a long time, happy I got the chance to buy and try this beer. Pours orange gold with big white head and lots of lacing. Effervescent, too. Strong hop aroma, with citrus and fresh cut grass. Similar hops in taste, but less pronounced. Hints of caramel or even honey to make a creaminess, along with a slight warming alcohol and scraping on tongue if you don't swallow right away. Pretty smooth all things considered. Delicious and unique. 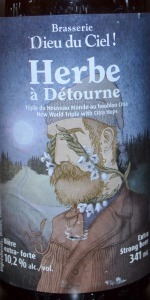 Herbe à Détourne from Brasserie Dieu du Ciel!